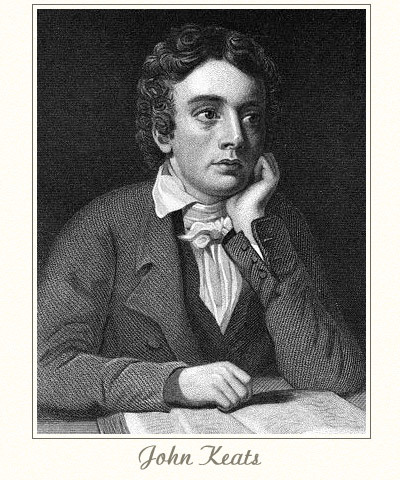 John Keats (1795-1821) was an English Romantic poet. He lost both parents before the age of fifteen and was ultimately raised by his grandmother, who saw that John got a good education. He spent a number of years studying to be a surgeon, but began indulging his growing interest in literature by writing poetry. John's early published work received blistering criticism, in part because he had none of the social standing, wealth, or university connections deemed essential in literary circles, but he became friends with several leading poets of the day and began to build a network of supporters. John published only three books of poetry during his lifetime and garnered no significant fame during that time but, today, he is considered one of the world's great poets. Thanks. A good reminder of classics. I enjoyed going over words familiar which still conjure up the emotions, which do not seem to change. I love that you intersperse the classics with the contemporary. A masterpiece even if a few "facts" are wrong.